The people of Bengal had been known since ages for their devotion towards Goddess Shakti, consort of Lord Shiva in her many avatars. During the autumn the Goddess is worshipped as “Devi Durga” or “Mahishashura Mardini” (Slayer of the Buffalo Demon – Mahishasura). She is frequently also worshipped in her Kaali avatar during the Diwali and other moonless days (Amabashyas) of a month. Mother Kaali had been worshipped by great sages like Sri Sri Rama Krishna Paramangsha Dev, Bamakhepa, Ramprasad as Bhabatarini Maa, Maa Tara and Maa Shyama. But how many of us are (except the people of the Hooghly District, West Bengal) aware that the Goddess is also worshipped as Maa Shankuntala or Raksha Kaali in Konnagar, a popular town located in the Hooghly District of West Bengal. 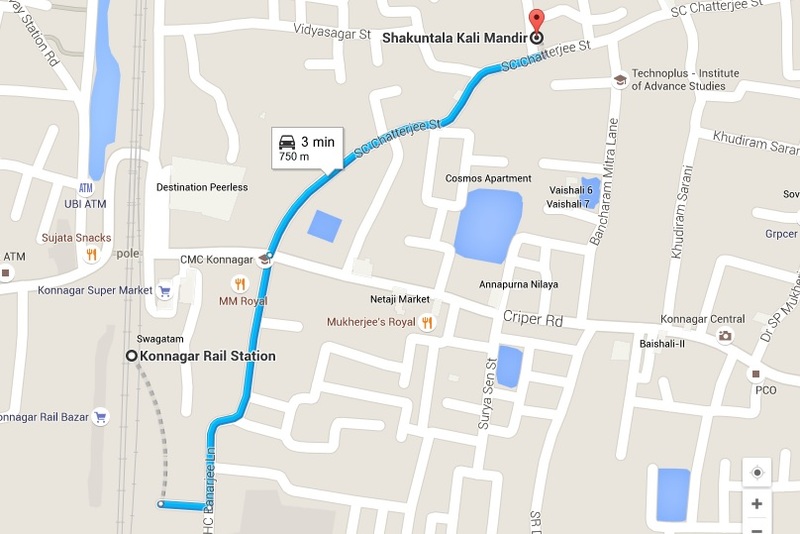 Konnagar is located very near to Kolkata and Howrah Station. It is connected to Howrah by the Howrah-Bardhaman main railway line as well as by the historic Grand Trunk Road connecting Kolkata with Delhi. Konnagar had grown up as a popular Hooghly town other than the historic Chandan Nagar and Chinsura. The Konnagar town is famous for its old heritage buildings that date long back to the days of the early Colonial Rule in Bengal. The town is flanked by the Hooghly river on its eastern side. The river’s cool breeze forms the respite to the people of Konnagar during the severe summer months of Bengal. But all these are different stories. 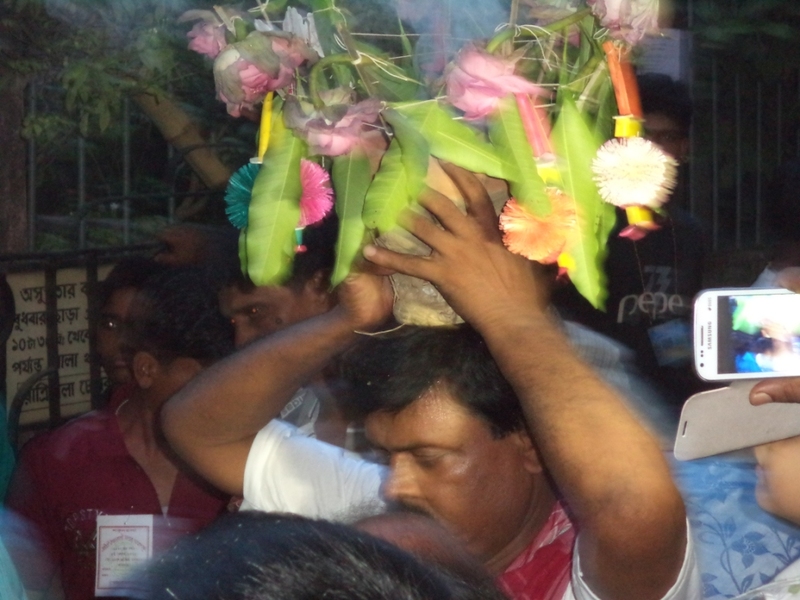 Today I am going to talk about the famous Raksha Kali Puja of Konnagar that is generally held in the Bengali calendar month of Baishakh or the month of April. The famous Shakuntala Kali Temple is located in the heart of the town near to the railway station. It is a mere 3 min car ride from the station taking the S C Chatterjee Street and moving eastwards towards the Hooghly ghats. Compared to any other Kali temple, this unique temple contains a paved platform (The Holy Bedi) without any deity. 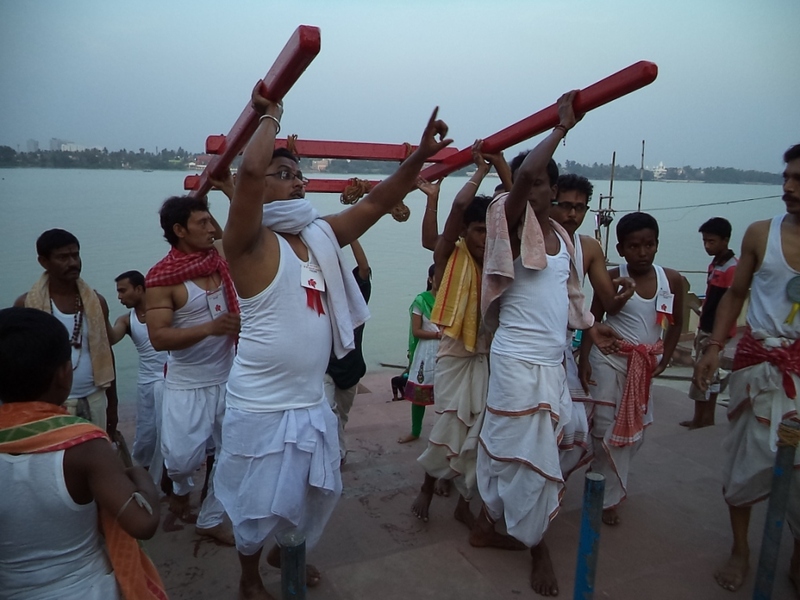 It is only during the annual Pujas held in April or Baishakh, the deity is made by the descendants of clay artists recommended by the royal family, worshipped and immersed before the sunrise of the following day in the holy waters of the Hooghly river. Historic records indicate that, Konnagar’s Shakuntala Kali Puja was first started by the scion of Chakraborty Bari, of ancient Hooghly and till date this Puja has become an integral part of Konnagar and Hooghly District’s culture, tradition and festival. 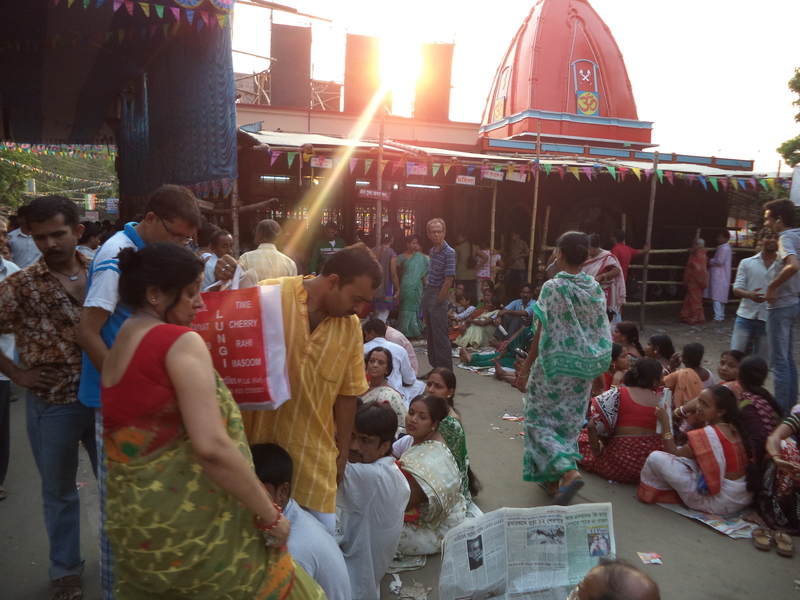 Thousands of devotees, tourists throng early in the wee hours for the beginning of the Puja. The Puja celebration begins at the wee hours, way before sunrise, when the ladies take their Kalash and Mangal Ghats (Holy vessels) to the bathing ghat of the Hooghly river. After bathing in the Holy water of the Ganges (Hooghly river), they wash the entire lane leading to the temple. Finally the early morning celebrations end with cleaning the Holy Platform (Bedi) to be used for worshipping the Goddess in the evening. This marks the beginning of busiest activity for the clay artists who are entrusted to complete the idol of the Goddess before the sunset. The artists complete painting, dressing and ornamenting the idol. And just before sunset, when the members of the royal family arrive to decorate the Goddess with her priceless ornaments – the real carnival begins. By then the narrow S C Chatterjee Street suddenly becomes the waiting place for lakhs of devotees who eagerly wait to witness the idol of the Goddess being carried to the temple from the studios of the clay artists. 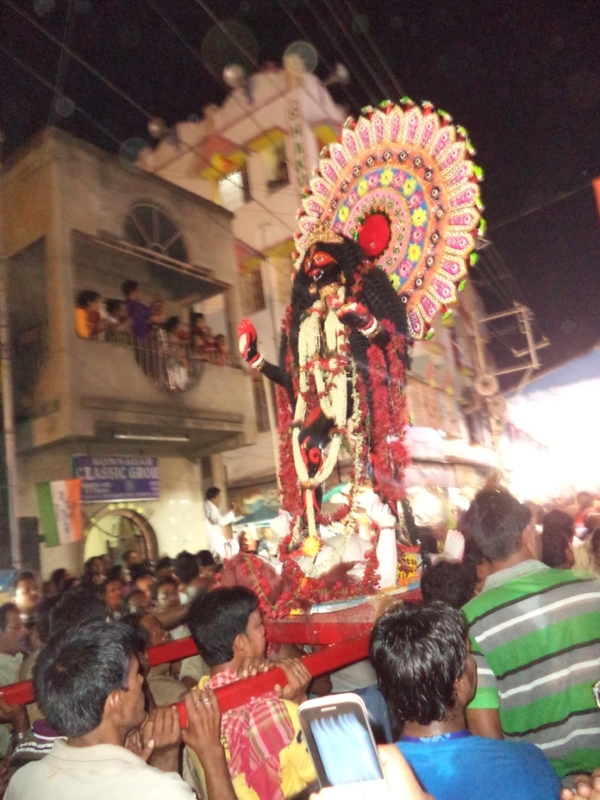 The surrounding houses around the street become the centre of commotion and buzz, with thousands of people standing on their balconies, doors, windows and roof-tops with flowers, coconuts, and bag full of batashas (local sugarcane Sweet meats) which are to be hailed on the Devi’s procession to her temple. By the mean time, a team of four or six young men get ready in their brand new dhotis. 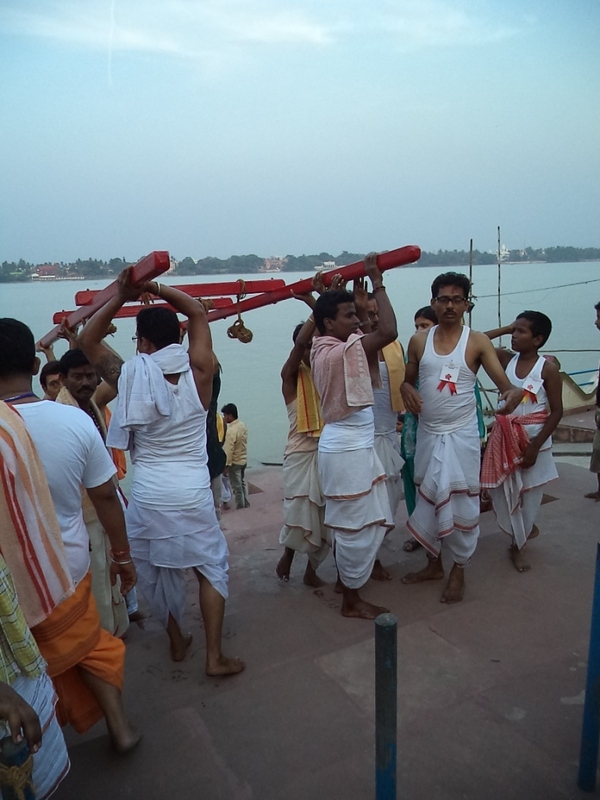 They carry the Holy carrying poles for lifting the idol and the Mangal Kalash to the Ganga Ghats (Hooghly river) for the Holy Dip amidst drumrolls and fanfare. The aura at the Ganga Ghat is tremendous. People throw themselves out of control dancing with the beats of the drums (dhak) and kartals. 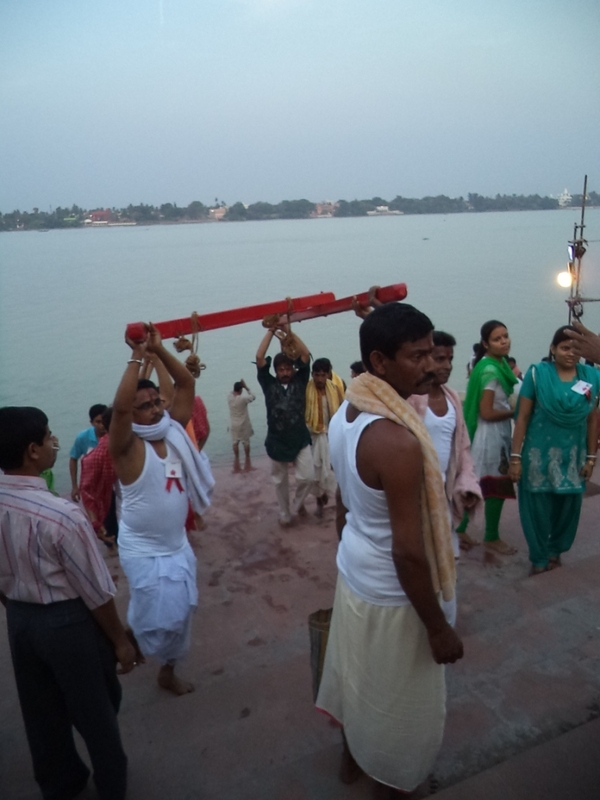 After enchanting prayers for the Eternal Mother the carriers take the bathed carrying poles just at the moment when the sun has set for the evening. By then, the idol of the Maa Shakuntala is lifted on the shoulders and carried to her temple. 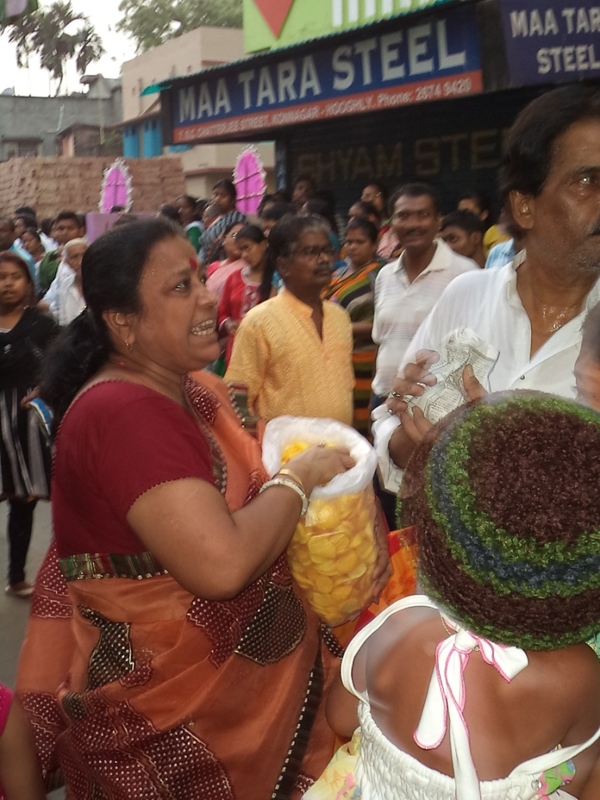 Kilograms of Batashas, Ladoos, flowers are thrown on the long procession from the people standing around S C Chatterjee Street and adjoining houses, welcoming the Eternal Mother with loud rolls of conch and drum beats. The Goddess is finally taken to her place of worship. The aura around Shakuntala Devi Temple is just as grand as the Rathayatra of Sri Sri Jagannath Dev at Puri. Arrival of the Enternal Mother in her place of worship, also formally marks the inauguration of the grand annual Raksha Kali Mela and Festival organized in and around the temple complex. In the mean time from the very early morning of the day itself, families take their positions in long cues for the holy “anjali”. Their stress are relieved with the sight of the Devi arriving at the temple. The Puja is started immediately with the close of daylight and continues the entire night till the very dawn. Before the slightest rays of sunlight bathes the earth, the Devi’s idol is again carried on the shoulders of her carriers to the Ganga Ghat for her immersion. Thousands of people with heavy hearts offer their prayers for the Devi at the Ganga Ghat and return their homes. The annual Raksha Kali Puja festival at Konnagar, over the years, have become an integral part of the culture of the Bengal and the people of the Hooghly District. 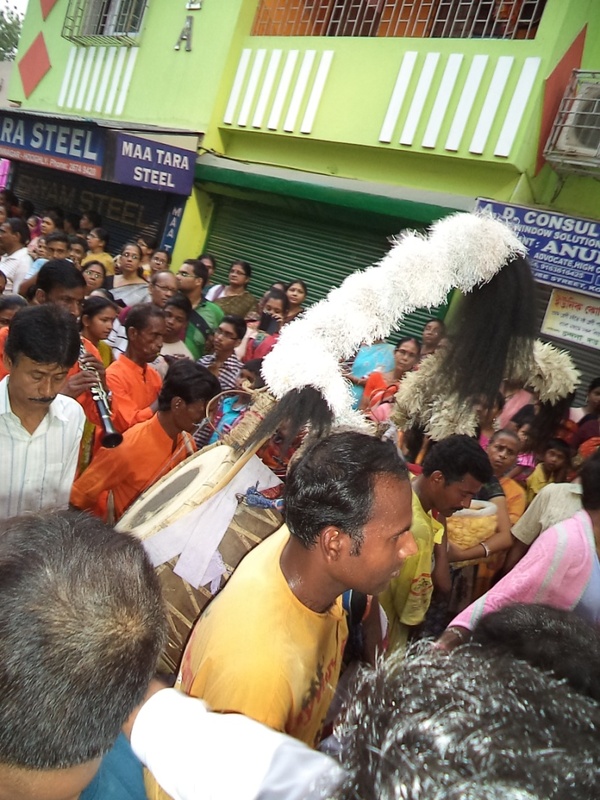 It is more of carnival, rather being just a mere Puja Festival. Lakhs of people wait for an entire year to pray for the Devi’s arrival in her temple. The festival is a boon for the local businessmen, halwais (Sweet-meat shops), florists, auto-walas, rickshaw walas and the economy of the town Konnagar.